I Love Tucson! It gives me a place for my creative side to surface! Check out my newest book release: One Woman's Journey by Dawn Kelly, Lifes inspirations from the Spirit of the Sword. 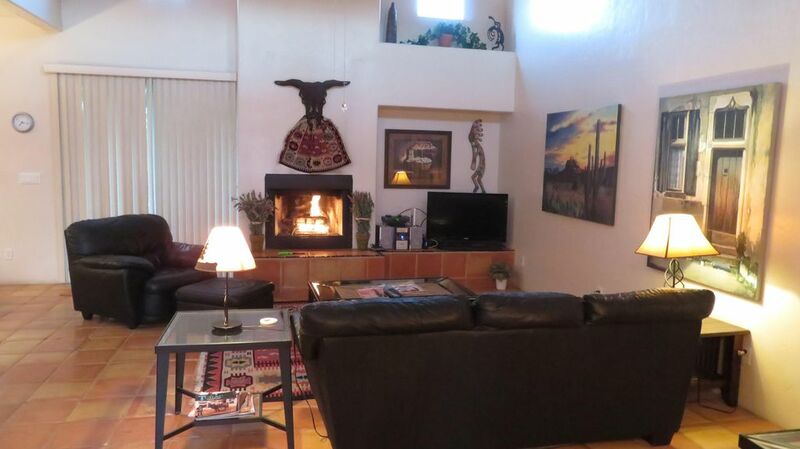 Starr Pass provides an oasis above the city to relax and enjoy! love the mountains and peaceful desert all around. If I want the exicitment of city, its right down the hill. Love the Golf course and Spa at the Marriott also! You enjoy the benefits of our golf membership! downtown is just a few minutes down the hill! Starr pass Golf resort with a 27 hole course right up the street and the JW Marriott 5 Starr hotel, spa and convention center are at the top of the hill! garage holds one car, additional parking in drive way. association discourages street parking. 4-6 comfortably- townhome is designed for up to 6 guests. The unit is set up as home away from home and has all the amenities to make your stay very comfortable. Number one the owner and property managers were so helpful and seem to anticipate renter's needs. Condo spacious, comfortable and well maintained; supplied well with kitchen and bathroom items. Location is very convenient; we golfed at Starr Pass using Dawn's discount: good golf at good price. We would definitely return . Perfect location for what we wanted to do. Great place located near golf and some great desert hiking. The golf discount is substantial and highly recommend playing there if you can. The hiking trails are close and the main reason we keep returning to Tucson. Condo was clean, well equipped and very comfortable for my family of 4. The town house is perfect! Comfortable, clean, complete! This is our second time renting Ms Kelly's properties. She and her managers definitely have their guests needs in mind. The townhouse was very clean, very inviting....very comfortable. It is located in a quiet area not far from markets and places of interest. The use of the gym and pool that comes with the rental is a great plus! A lovely place to stay. Everything was perfect! The rental procedure on-line was so easy to do. Dawn was great and communicated back to me via email very quickly with rental instructions. The condo was very clean and had everything we needed. The kitchen was fully loaded with everything needed to cook and they even had coffee in the refrigerator, so we could make a cup the morning after we arrived. One other thing I really liked about this condo was the two car garage (with the remote for easy access.) The condo has a split floorplan with the master (w/King bed) on one side and a bedroom (w/2 full beds) on the other side. There was also a washer and dryer (soap & dryer sheets too) in the garage that came in handy! There is a pool and gym key to use while you stay (a good walk for adults, but if you have children, it would be better to drive to it). I am a returning customer and will stay here again when I return to Tucson! Starr Pass was a great location to enjoy Tucson as everything was pretty close. The condo was well stocked with cookware and a few necessary food items when we arrived. Check-in could not have been easier. The only draw back was the road noise which we pretty much got used to during our stay. Pool, exercise room and golf course were close by as was the Catalina Grill which we enjoyed a lot. All in all it was an enjoyable stay. yes, while i was in Tucson at my place up the street I too heard " Crotch rocket boy"
-lol- who either is a new hire at the JW Marriott or at the golf course - and either doesn't care or has no clue his little motorcycle can be heard all over starr pass. not quite sure what to do about him... probably all residents of Starr pass are feeling the same thing... perhaps a neighbor ambush?? Other than that, Starr pass is a pretty peaceful place to live. and as many things in life, , this too will pass... And yes, those great high ceilings that so many people enjoy and also that give our place a spaciousness would certainly echo for noises as mentioned above. As for cars, street noise, airplanes above etc, many people own property and live by Starr pass blvd including myself and sounds are just things that you incorporate into your life. Glad to hear you enjoyed the décor and feel of the place, hopefully you took advantage of our guest privileges at the club with the pool, Jacuzzi, work out room, and golf discount. and yes, our managers are really great! they care about our guests and it seems each quest has some special need so we try to accommodate each one. Now lets see if "Crotch rocket boy" moves on! The location is Starr Pass in Tucson, a desert Oasis in the mountains that includes the location for the new 5 Star Marriott hotel and convention center and the Starr Pass resort with its champion 27 hole golf course. Located above the city but only minutes away to vibrant downtown, the University of Arizona, the convention center , museums and shopping . You can access both I-10 and I-19 right down the the hill making it accessible to all of Tucson and southern Arizona. Golf: The Starr Pass championship 27 hole course is the center of Starr Pass! fantastic views from every hole. as guests of our membership you receive a 50 percent off rate off your game! Gem Mineral show pricing is 7 day min 1750.00 per week and 250.00 per day.